Malati Choudhury was born in 1904 She belonged to a Brahmin family. Her father, Barrister Kumud Nath Sen died when she was only two and a half years old. Her mother Snehalata Sen was a good writer who wrote Jugalanjali and translated some works of Rabindranath Tagore. Malati had a good background. Her maternal grand father Beharilal Gupta was an ICS officer. Her two cousins Ranjit Gupta was former Chief Secretary of West Bengal and Indrajit Gupta was the former Home Minister. Her two brothers were also genius. P. K. Sen was former Income Tax Commissioner and K. P. Sen was former Indian Postal Service officer. At the age of 16 Malati Choudhury was sent to Santiniketan where she got admitted to Viswa-Bharati, founded by Tagore. She was very lucky that she got the chance to acquire knowledge directly from Rabindranath Tagore at Santiniketan .Once her mother wrote, Malati was very happy and benefited much from her residence at Viswa-Bharati as a student. The personal influence of Gurudev and his teachings, his patriotism and idealism, have influenced and guided Malati throughout her life. In Santiniketan, Malati not only obtained degree but also acquired huge knowledge in various types of art and culture. Malati Choudhury was immensely influenced by Tagore`s principles of life, views on education and development and patriotism. Gurudev affectionately called her `Minu`. Malati Choudhury came in close contact with Nabakrushna Choudhuri who came from Sabarmati Ashram to study at Santiniketan.She married Nabakrushna Choudhuri in 1927. After marriage they settled down in Orissa and started various types of social activities regarding rural development. They helped poor farmer to improve sugarcane cultivation. They also started adult education in the surrounding villages. At the time of Salt Satyagraha Malati Choudhury and her husband plunged into that and joined Indian National Congress. They were arrested and imprisoned. In the jails they taught the fellow prisoners and propagated Gandhiji`s thoughts and views. In 1933 she formed Utkal Congress Samajvadi Karmi Sangh along with her husband. Later this organization came to be known as Orissa Provincial Branch of the All India Congress Socialist Party. In 1934, she joined Gandhiji in his famous padayatra in Orissa. 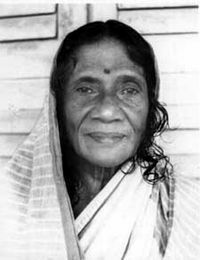 In 1946 Malati Choudhury set up the Bajiraut Chhatravas at Angul in Orissa and the Utkal Navajeevan Mandal in 1948 at Angul in Orissa. Bajiraut Chhatravas was formed to spread education among the children of the freedom fighters, scheduled castes, scheduled tribes, other backward classes and under-privileged sections of society. Utkal Navajeevan Mandal mainly worked for the rural development and tribal welfare in Orissa. Indian government established The State Resource Centre for Adult Education in Orissa with the help of Utkal Navajeevan Mandal in 1978. Malati Choudhury also founded the Post basic School at Champatimunda. Apart from her great role in spreading education and rural welfare he established herself as a dedicated freedom fighter. She accompanied Acharya Vinoba Bhave during Bhoodan Movement. Malati Choudhury also joined Gandhiji during his Noakhali visit. Gandhiji affectionately called her `Tofanee`. She led the `Krisaka Andolana`to save the poor farmers from the grasp of Landowners and Moneylenders. In 1946 Malati Choudhury was selected as the member of Constituent Assembly of India. She was also elected as the president of the Utkal Pradesh Congress Committee. After independence she continued to fight for the cause of backward classes. When her husband served as the Chief Minister of Orissa she launched various rural reconstruction scheme in Orissa. When Emergency was promulgated Malati Choudhury protested against the policy of Indira Gandhi Government and was imprisoned. Malati Choudhury received several prizes for her dedication to the nation including, National Award for Child Welfare (1987), Jamnalal Bajaj Award (1988), Utkal Seva Sammaan (1994), Tagore Literacy Award (1995), Honour by the Lok Sabha and Rajya Sabha on the occasion of the 50th Anniversary of the first sitting of the Constituent Assembly (1997), Honour by the State Social Welfare Advisory Board (1997), Honour by the Rajya Mahila Commission (1997), and the `Deshikottama (D.Litt. Honoris Causa) from her Alma Mater, Viswa-Bharati.She refused to take Jamnalal Bajaj Award from the hands of the then Prime Minister Rajiv Gandhi, because she thought Rajiv Gandhi did nothing to propagate the views of Gandhiji. She passed away in 1997 at the age of 93.